Too many people in Wales, and across the UK, are struggling to put food on their table. I have heard about this problem in Merthyr Tydfil and Rhymney and given my support to local efforts to help tackle this problem. 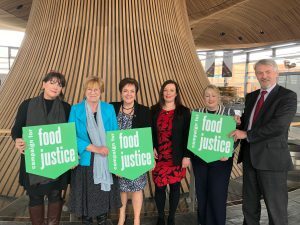 The Co-operative Party are also running a Food Justice campaign and today I was pleased to join Welsh Labour AM colleagues to show our support to this work. You can read about the Co-op campaign here. In 2019 it is a matter of shame that we have to campaign for the right to ensure people receive a decent, healthy meal. Over 1 million people live in food deserts. Like some local organisations in the constituency the aim is to tackle hunger and ensure everyone in the UK is able to make healthy food choices.